Radiograph of the foot post operatively. 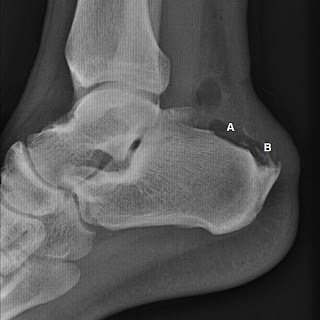 The Haglund bump (A) and calcific deposits (B) in the Achilles tendon had been removed. The treatment of Haglund Syndrome can be divided into non surgical and surgical methods. In the majority of cases, treatment starts non surgically. Surgical treatment will be offered should the symptoms do not respond to non surgical means. The primary cause of the pain is shoewear and pressure over the back of the heel. The first obvious approach would be not to wear shoes with counters such as slippers. If shoes are to be worn, silicon padding could be applied over the counters to provide a softer area to prevent attrition. Other modes of treatment are aimed to decreasing the inflammation of the surrounding area and Achilles tendon. This can be done with non steroidal anti-inflammatory medication, wax therapy and ultrasound. Trancutaneous electro nervous stimulation could be applied for pain relief. If the symptoms are not relieved by these means and there are signs of mechanical impingement such as a large Haglund bump and calcification within the Achilles tendon, surgical intervention may be warranted. The main aim of surgery is to relieve the pressure over the back of the heel by reducing the prominence. This may be done by removing the Haglund bump or by performing a calcaneal wedge osteotomy. With time, the thicken tissue over the back of the heel with shrink to its normal size. The Haglund bump may be removed surgically by two methods: open (via an incision) or endoscopic (small incisions). In both modes, a portion of the bump is removed and reshaped to prevent impingement onto the Achilles tendon. The retrocalcaneal bursa and space are thoroughly debrided. In patients with calcified Achilles tendons, an open method of excision would be appropriate to remove the calcification within the tendon. After the operation, the incisions will be sutured and the foot wrapped in soft bandaging. A half plaster cast would be applied to prevent excessive movement and for pain relief.